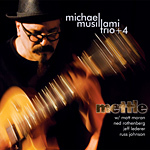 Mettle is veteran guitarist/composer Michael Musillami's sixth recording with his flagship trio featuring bassist Joe Fonda and drummer George Schuller. The music, including Musillami's first extended work, the eight-movement Summer Suite: Twenty Ten, is largely autobiographical, but the record itself celebrates the trio's 10th anniversary as a working unit. On Mettle, they form the core rhythm section of a new sextet, featuring special guests Russ Johnson (trumpet), Ned Rothenberg (alto saxophone and clarinet), Jeff Lederer (tenor saxophone and clarinet) and Matt Moran (vibraphone), created to fully realize Musillami's latest compositions. For 10 years now, guitarist Michael Musillami has had the kind of hand-in-glove fit with drummer George Schuller and bassist Joe Fonda that is truly rare in jazz. Mettle is Musillami's most ambitious and exhilarating effort to date. ...a band that keeps getting better with every release. The criminally underrated guitarist Musillami celebrates the tenth anniversary of his trio by inviting along four friends for a sterling set of vibrant post-Bop. The long suite that occupies most of the disc is at times reflective and spacious, as during the probing Musillami solo during "Iceland." The Piazzolla piece in particular is a hoot, and demonstrates to those who aren't following this group (and what's your excuse?) Musillami's compositional range. A fantastic disc as usual from Musillami. The composer takes full advantage of his expanded palette, experimenting with the various combinations and colors that his guests provide. Mettle joins the catalog as one of Musillami's strongest efforts yet, weaving his rubbery sound into a tapestry of clench-jawed blues, tart tango, and hip-hop inspired grooves. Augmented by four of Downtown's finest improvisers, Musillami's expanded ensemble interprets a handful of intriguing originals, as well as his first extended suite, the autobiographical eight-part reminiscence, "Summer Suite: Twenty Ten." Bolstered by the stellar contributions of vibraphonist Matt Moran, trumpeter Russ Johnson and vanguard multi-reedists Jeff Lederer and Ned Rothenberg, Musillami and company embark on a bracing journey through some of the leader's most captivating compositions. Although blues, bop and swing are omnipresent influences, Musillami's writing ranges far and wide for stylistic inspiration, which includes distinctive interludes subtly informed by everything from tango ("Piazzolla On The Porch") to hip-hop ("Thuggish Mornings"). Guitarist Musillami, always a forward thinker, expands his well-established trio into a talent-packed septet. Musillami's beautifully-balanced arrangements keep it tight, walking close enough to straight-up modern jazz to be appealing but with a sly subversive streak, too. Really good stuff. The compositions are weighty, the arrangements strong, the band cooks... A nice monster of a set. Get it. Once again, he proves his mettle as a player, composer and leader. Michael Musillami shows continued growth and new strength on Mettle. The tunes are all strong, the arrangements impressive and his playing shines. Yet, this is primarily an ensemble recording and he allows his six fellow travelers plenty of room to display their talents...an impressive CD. Each piece in the suite tells a story, creating an engaging compendium of musical memoirs that you can listen to straight through in one sitting or tune in to at different times as separate pieces. Sweet pleasures are derived either way you choose to listen, thanks to the quality of the composing, arranging and the soloing and collaborative efforts of this happy band of brothers...the Gold Standard for smart, vibrant chamber jazz groups to measure up to.